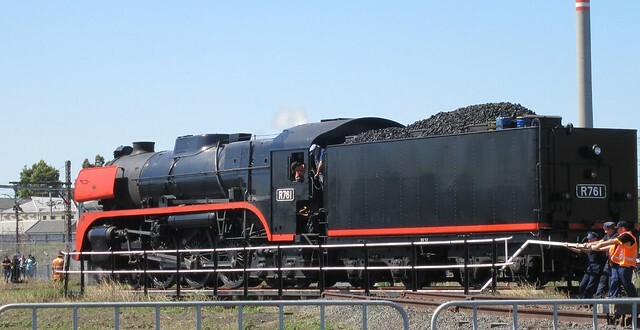 I haven’t been to one of Steamrail’s open days before, but went along with my sister, her kids, and some friends. I was most amused to find my nephew Leo happily shouting out engine numbers as they steamed past. I might have to get him an anorak and clipboard for his next birthday. On a turntable, a few Steamrail volunteers were showing how to turn an engine by hand. Unlike in innumerable Thomas The Tank Engine stories, the turntable didn’t spin out of control making the engine moan with dizziness. Nearby were lined up a brand new shiny X’Trapolis train (not yet with Metro sticker on the front) and an older one marked “in testing”. Oh, hello Darling! 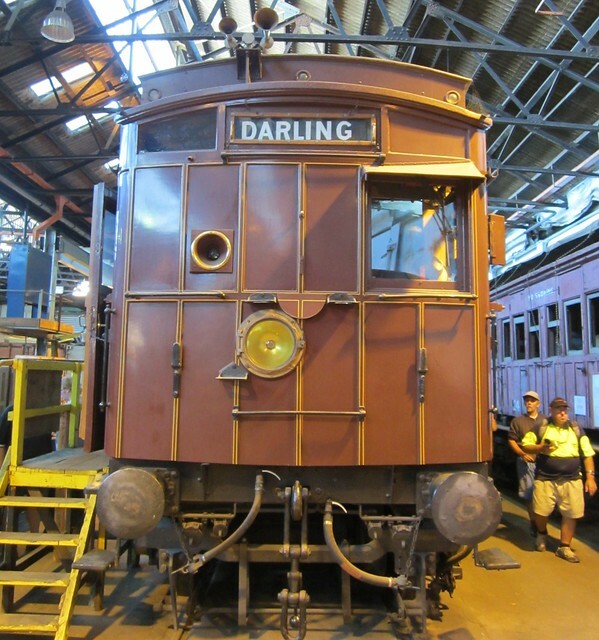 A swing-door train, built in the 19th century, converted to electric power in the 1920s, and still running in service into the 1970s, now restored. One of those old cords that would apparently bring the train to a halt. 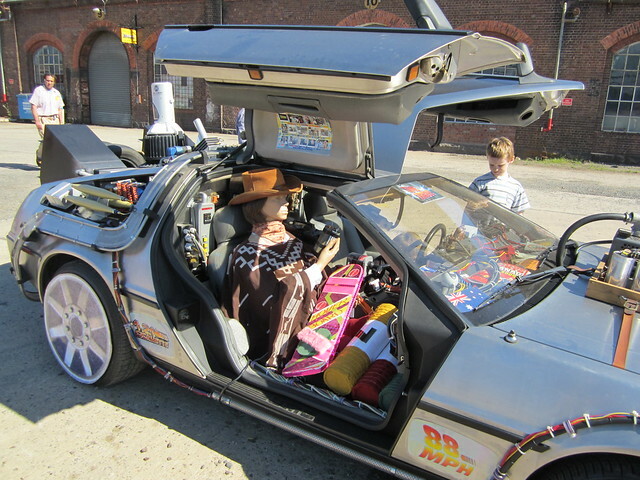 This Back To The Future Delorean was also on display… the same one seen recently at my friend Andrew’s 40th birthday party, and still very impressive. Apparently they earlier had set it up to recreate a scene from the 3rd movie. 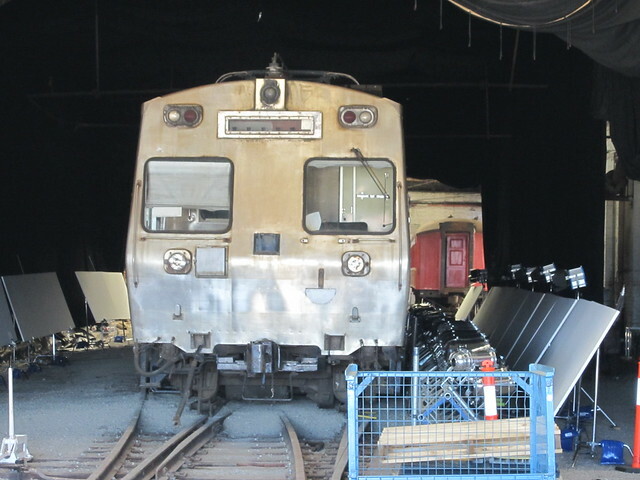 A Hitachi carriage that appears to be being used for filming at present — presumably used for its interior. And of course there were various steam trains chuffing about the place. Next → Next post: Who “owns” your surname? I’d like to go back to an open day weekend when they have the Taits or Swingdoors up and running. 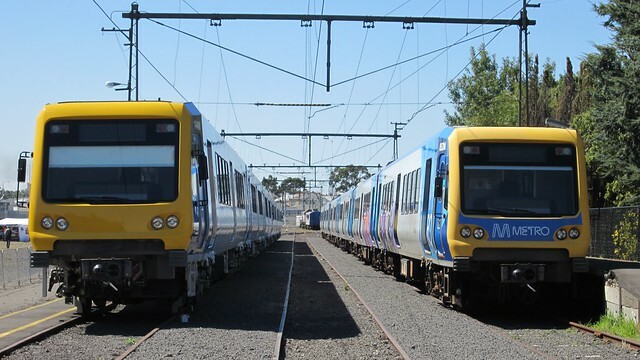 For that matter, I’d love to see these old trains running a suburban tour – I’ve never had the priviledge of riding on one, although I have been inside a Tait at a previous open day weekend. Great fun! People might wonder why kids did not pull the communication chain for a lark? They were covered in rust and filthy dirty. You would not want to touch the chain if you didn’t have too. Is it just me or is the Delorean’s rear spoiler a glued on bit of cardboard? Why would you ruin the car like that? Sorry I meant rim not spoiler. I notice some grubs attacked 853M-1627T-854M(On the right) with an unssesary paint job. I’m fairly certin it wasn’t there on sunday. What is the recessed lens like thing for, on the Tait trains. I have always thought they may be some sort of old headlight and the one in the centre is possibly a newer addition which gave better light. Am I correct? @Michael, I think the Tait/Swing-door trains do run occasionally. 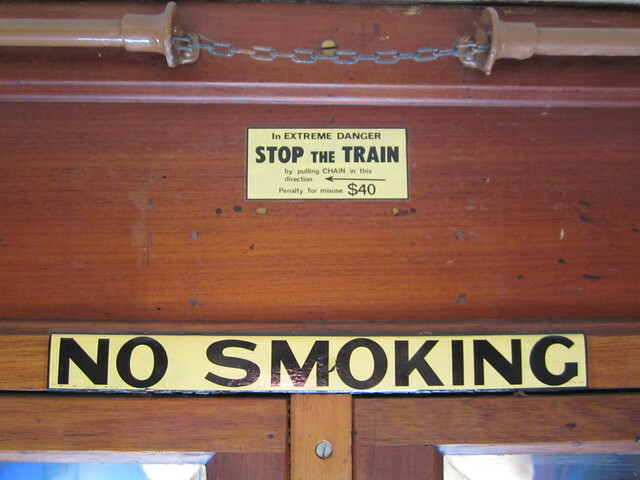 Keep an eye on the Steamrail web site. @Ozsoapbox, yeah the wheel rims had stuck-on thingies. Not sure why. Maybe he’s hoping to convert to alloy wheels at some stage and considered that the current wheels don’t look good enough. I agree with you; it doesn’t look great at present. @Pippa, just to be a pedant, that’s not a Tait train, it’s a pre-Tait swing-door train above. The Taits all had sliding doors. I think looking closely, the recessed light is a red tail light. It might be that the headlights (at least on the swing-door trains, which ran originally with steam engines) were added as part of the conversion to electric operation. Is that where the classic movie (just finished watching it on ABC 2) Malcolm, filmed their opening scenes? >> yeah the wheel rims had stuck-on thingies. Not sure why. Maybe he’s hoping to convert to alloy wheels at some stage and considered that the current wheels don’t look good enough. I agree with you; it doesn’t look great at present. DeLorean’s have alloys stock standard, the same ones featured in BTTF. However, that pictured DeLorean is an imitation of the time machine specifically from BTTF part 3 (as evidenced by the replacement time circuit on the hood). To that end those crappy cardboard covers over the wheels are trying to imitate the “rail wheels” from when the Doc mounted it to the railway line. Nice attention to detail but completely unnecessary – nobody would think twice about the stock DMC rims being there.